Sometimes the most unlikely friendships are the most rewarding. Case in point: Remy and Emile, two caring rats with a very important job. Remy and Emile live at the Brooklyn Cat Cafe, a volunteer-driven nonprofit run by Brooklyn Bridge Animal Welfare Coalition (BBAWC). Here, the twosome groom, snuggle and romp around with kittens 8 weeks old and younger. 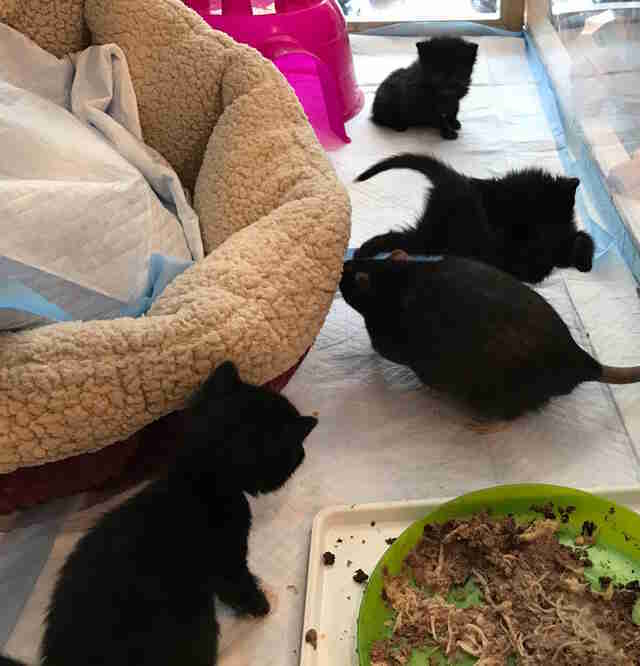 The rats care for the kittens until they grow large enough to leave the nursery (known by staffers as the “kitten terrarium”) and go home with their adoptive families. The pairing may seem like one of the more unconventional interspecies friendships, but these kittens are far from predators when it comes to their rat best friends. The young rats were adopted in April from Helping All Little Things (HALT), a rescue organization devoted to saving small animals. Remy and Emile were aptly named after the two brothers from Pixar’s “Ratatouille,” and they closely resemble their animated counterparts. Remy is a portly brown rat, while Emile is slender with gray and white markings. The rats are kind and affectionate, notes Anne Levin, founder and manager at Brooklyn Cat Cafe. They love to climb, play, give kisses and be pet by the staff. “With Emile, you rub his belly and he makes these cute tinkly sounds, like he’s laughing, and it’s incredibly sweet,” Levin tells The Dodo. 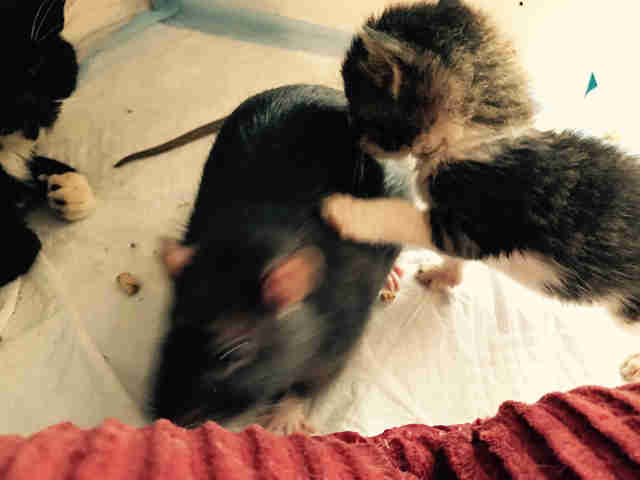 We tend to think of rats and cats as mortal enemies, but when you see them interacting with the feline babies, the mutual love is hard to deny. The rats tend to the babies like two doting fathers, though it’s pretty apparent they are not of the same species. 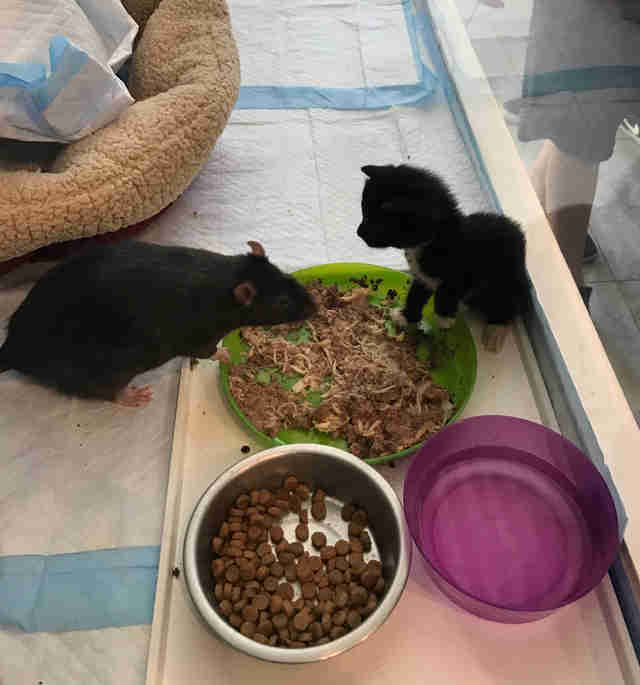 “Even though the kittens are clearly different sizes, I think [the rats] recognize that they are not adults, so they have a paternal attitude towards them,” Levin says. Even though the relationship between the rats and cats is loving, they are rarely left unattended while they play. 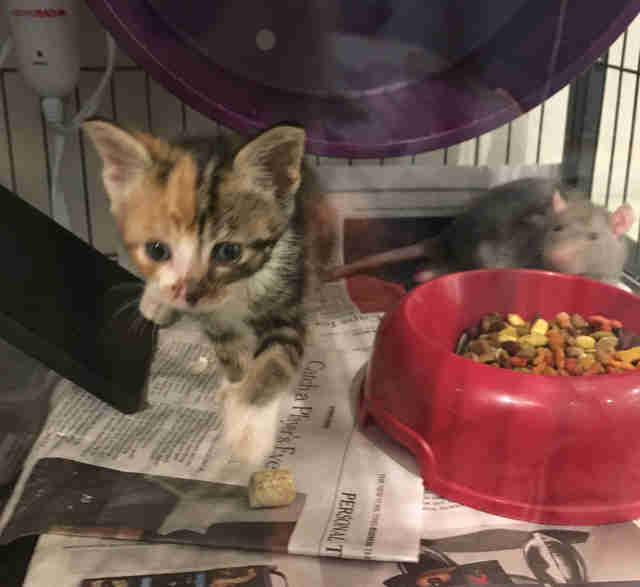 “Because the kittens need to be fed 24 hours a day, someone is with them almost all the time, so there is supervision,” Levin notes. 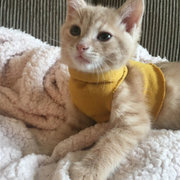 To donate, volunteer or adopt an animal, check out Helping All Little Things and the Brooklyn Cat Cafe for more information.